When it comes to managing the details of your financial life, you’ll feel confident knowing you have a team of professionals on your side. 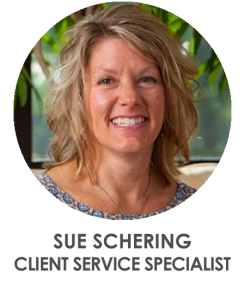 You’ll enjoy interacting with Sue Schering as a member of your service team. Sue works with our Wealth Advisors to help them prepare for effective client meetings, as well as to supporting action items that come from them. Sue’s helpful and cheerful spirit will help you feel welcomed and personally valued as we help you confidently navigate your financial path. Sue and her husband Brent met in Canton, Ohio and resided in southern Ohio for 14 years before moving to West Michigan, which they have called home for the past 5 years. Devoting their time to their two daughters, as well as living an active and healthy lifestyle, are most important to Sue and Brent. The Schering’s spend much of their time in the outdoors, participating in numerous sports activities and following their girls’ passion for swimming. When not working, she fills her time with a variety of sports, gardening, cooking, travel, reading, and most favorably – spending time with family. Sue especially enjoys seeking adventures in the mountains with her family.